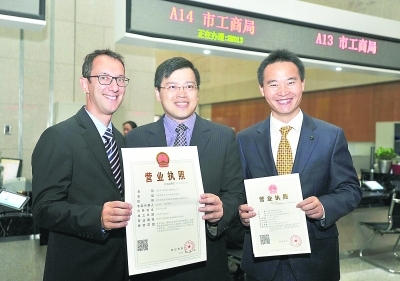 On October 11, Wuhan Feifan Energy and Technology Company, a newly established Italian WFOE (Wholly Foreign-Owned Enterprise) company in Wuhan, received their business license from the Wuhan Industry and Commerce Administration. It was the first foreign business license issued in Wuhan since the new foreign investment registration policy went into effect in China. It also marked the start of the implementation of the "Pre-establishment National Treatment" combined with the "negative list" approach for foreign investment here in Wuhan. Foreign investment in all sectors will be allowed unless listed as prohibited or restricted under the "negative list." In the past, to establish a foreign company and to apply for a foreign business license, approvals from relevant commerce departments needed to be acquired first. "It used to take up to 20 days just to do that," said Pan Weihan, GM of the company, and they had set up two Italian companies in Wuhan. He said, "This time, it takes only 3 days." With this new approach to be used in Wuhan, it will help increase efficiency for foreign investors when they register their companies. At the end of this past September, there were 4,920 foreign-invested companies in Wuhan. The new policy will affect more than 90 percent of these companies in terms of examination, approval, and registration procedures.